Garden scents, as well as sense! We've pulled together a great collection of fragrant plants that will keep your nose happy all season. 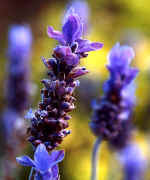 Foliage as well as flowers can be fragrant. A mix of permanent and annual plantings will ensure you have a heavenly place to relax. Four-o'clock (Mirabilis jalapa and M. longiflora) Multicolored trumpet flowers cover bushy 2-foot-high plants. M. longiflora has white flowers with orange-blossom scent; 2 by 3 feet. Peruvian daffodil (Hymenocallis species) Especially 'Sulfur Queen'; white or yellow spidery summer-blooming bulb; 18 inches high; perennial in zones 8-10. Sweet alyssum (Lobularia maritima) Low-growing groundcover with honey-scented white flowers; highly attractive to beneficial insects; 6 by 8 inches. The other shades are not as fragrant. Tuberose (Polianthes tuberosa) Extremely fragrant white flower spikes; late-summer bloom; 3 by 1 feet; perennial bulb hardy in Zones 8-10, grown as an annual in cooler climates. There are single and double flowered varieties. Wallflowers (Erysimum asperum [biennial] and E. perofskianum) Short spikes of yellow or copper-colored flowers; 12 by 10 inches. Autumn snakeroot (Cimicifuga simplex) Foot-long spikes of white flowers in autumn; partial shade; 3 by 2 feet; Zones 4-8. Creeping phlox (Phlox stolonifera) 'Bruce's White'; shade tolerant; spring blooms; 1 by 1 foot; Zones 2-8. Daffodils (Narcissus) Many varieties in the poeticus, triandrus, jonquilla and tazetta groups are highly fragrant, especially 'Buffawn', 'Canarybird', 'Cragford', 'Geranium', 'Trevithian', and 'Tripartite. Daylilies (Hemerocallis) Here are 14 of the most widely available, highly fragrant daylilies: 'Audacity Bound', Barbara Mitchell', 'Ellen Christine', 'Ever So Ruffled', 'Forty Carats', 'Fragrant Light', 'Hyperion', 'Ida Miles', 'Kathy Rood' , 'Scape Stopper', 'Tetrina's Daughter', 'Top Honors', 'Vanilla Fluff', Hemerocallis citrina, H. lilioasphodelus. 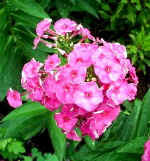 Garden Phlox (Phlox paniculata) especially white 'David', 'Blue Paradise', pink 'Eden's Crush', and 'Old Cellarhole'; summer blooms; 3-5 by 2 feet; Zones 4-8. Ginger lily (Hedychium coronarium var. chrysoleum 'Yellow Spot') Large spikes of exquisite white flowers in mid to late summer; sun or part shade; 4 by 3 feet; Zones 7-10. Hostas (Hosta ) Only some varieties are strongly fragrant, including 'Fragrant Bouquet', 'Guacamole' and the species H. plantaginea. Trumpet-shaped white flowers in summer; sun or part shade; 2 by 3 feet; Zones 3-8. Hyacinths (Hyacinthus) The most fragrant hyacinths for spring color and sweetness are 'Blue Jacket', pink 'Anna Marie', and white 'Carnegie'; 8 to 12 inches tall; Zones 5-9. Iris (Iris) Highly fragrant bearded irises include 'Dark Passion', 'Fort Apache', 'Last Chance', 'Mary Frances', 'Old Black Magic', 'Pacific Mist', 'Scented Bubbles', 'Stepping Out', 'Thriller', and 'Sweet Lena'; also I. pallida variegata; Zones 3-10. Lilies (Lilium ) Many hybrid trumpet and oriental lilies are strongly fragrant, including 'Casa Blanca'; Also richly scented are Goldband lily (L. auratum; Zones 4-9), Regal lily (L. regale; Zones 4-8), L. formosanum (Zones 5-8) , and Madonna lily (L. candidum; Zones 6 -9); heights range from 3 to over 6 feet; bloom times vary. Sweet violet (Viola odorata) Small purple, rose, or white flowers in late winter/early spring; partial shade; 4 by 6 inches; Zones 7-9. Tulip 'Apricot Beauty' is one of the most fragrant tulips; early blooming; 18 inches high; Zones 4-6. Woodland phlox (Phlox divaricata) ''Blue Perfume', 'White Perfume'; spring blooms; shade tolerant; 1 by 1 foot; Zones 3-8. Daphnes Daphne x burkwoodii 'Carol Mackie' and 'Somerset' Legendary powerful fragrance from small white or purplish flowers in late spring; 3 by 3-5 feet; Zones 4-6(7). Many other daphne species are also highly fragrant, including Garland flower (D. cneorum), Alpine daphne (D. alpina), Caucasian daphne. D. caucasica), Winter daphne (D. odora), February daphne (D. mezereum ), D. bholua and D. tangutica. Lilacs (Syringa) Of the hundreds of varieties of this popular 8 to 10 foot high shrub, the most highly fragrant and disease-resistant choices for Zones 3 to 7 are: 'Henri Robert', 'Excel', 'Vauban, 'Rhum von Horstenstein' and 'Miss Kim'. Gardeners in Zones 8 and 9 need to choose heat-tolerant lilac varieties such as 'Angel White', 'Big Blue', 'Blue Skies' and 'Lavender Lady'. Mock orange (Philadelphus coronarius) Most species and varieties of this old-fashioned favorite have strongly-scented showy white flowers in early summer; 10 by 8 feet; some hardy to Zone 3. Paper bush (Edgeworthia gardenii) Yellow flowers in late winter; 5 by 5 feet; Zones 7-10. Viburnums Korean spice viburnum (V. carlesii) has powerfully fragrant small white flower clusters in spring; sun/partial shade; 6 by 6 feet; Zones 5-8. Many other viburnums are also highly fragrant, including V. x bodnantense 'Pink Dawn', V. x burkwoodii , V. x carlcephalum, V. x judii, V. odoratissimum, V. farreri, and V. bitchiuense. Size and hardiness varies. Wintersweet (Chimonanthus praecox)1 inch yellow flowers in late winter; 12 by 12 feet; Zones (6) 7-9. Witch hazels (Hamamelis mollis, H. vernalis and hybrids) Long-lasting spidery yellow, orange, or red flowers open in winter; part shade or sun; 15 by 15 feet; Zones (4) 5-8. Jasmines Several species are legendary for their perfumes, including Poet's jasmine (Jasminun officinale), Winter jasmine (J. polyanthum), Arabian jasmine (J. sambac), and Pink summer jasmine (J. x stephanese); size and bloom times vary; most are hardy in Zones 8-10.